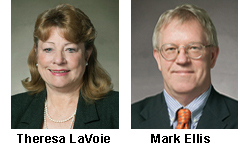 Ellis Law Group Partners Theresa LaVoie and Mark Ellis successfully defended the Western Placer Unified School District before the California Third District Court of Appeals against an employee, Richard Thornbrough, who claimed he had been wrongfully terminated for among other things, First Amendment protected speech. The case, Thornbrough v. Westem Placer Unified School District, also involved claims the hearing officer who heard the termination hearing was biased, as well as other supposed violations of due process. The Third District Court of Appeal in a January 2014 decision rejected all of Thornbrough's contentions and held in favor of WPUSD on all issues. termination claim on the fact that he and the District's Director of Maintenance had reported suspected wrongdoing in connection with certain District construction projects. Reports of their suspicions were submitted to the District's Board of Trustees, and the Grand Jury. WPUSD contended Thornbrough's termination has nothing to do with his reports but rather for several incidents of misconduct, which included: repeated insubordination, denigration of his female supervisor, ethnic derision of a subordinate, sexual harassment of a district employee, retaliation against the sexually harassed employee for reporting the harassment, and downloading pornographic content onto a District computer. The appellate court rejected the plaintiff's arguments that the hearing officer was biased and that during the hearing Thornbrough was denied Due Process because, among other allegations, he was given insufficient time to respond to amended charges. In the published opinion, the court found that the District had more than sufficient grounds for terminating Thornbrough and the court went on to reject Thornbrough' s retaliation claim as well. Ellis and LaVoie also successfully tried the underlying wrongful termination (Skelly) hearing on behalf of the WPUSD from which the appeal arose. The citation of the published opinion is Thornbrough v. Western Placer Unified School District (3rd Dist. 2013) 223 Cal.App.4th 169.